When trading, things sometimes don’t turn out to go entirely according to your plan. But what do you do if this happens? Do you sit tight and wait, close the trade or do something else? In this article, you will learn about a few options adjustment strategies that will help you deal with struggling options trades. These adjustment techniques will help you minimize your risk without eliminating the potential for profit. Before we get into any specific options adjustment strategies, I want to start by presenting a few general principles to always follow when adjusting your positions. This first point isn’t really an adjustment principle. Instead, it is a general trading guideline. In my opinion, the most important part of a trade is the entry. No adjustment methods will allow you to turn an otherwise terrible trade into a good one. This means you should spend the majority of your time on the opening process of your positions and not on the adjustment process. In other words, a good trade setup and entry is far more important than any trade adjustments. Will I adjust this position if it goes against me? For some options strategies, it might not necessarily make sense to adjust the trade at all. Sometimes, taking a small loss can be superior to any adjustments. But it is important to decide this before putting on the trade. At what point will I adjust it? If you decide that you want to adjust your trade if it goes against you, you need to set a clear adjustment point. This adjustment point could be a price level of the underlying asset, a certain delta value, an implied volatility level or something else. How will I adjust it? Last but not least, you should also plan how you potentially will adjust the trade. Here you don’t have to know every single detail, but you should definitely have an idea about how you will adjust the position if it reaches your adjustment point. This guideline is about where to set your adjustment point. You should not adjust your position extremely aggressively. You should not adjust your position as soon as it goes slightly against you. Give your trades some room to breathe. One reason why you shouldn’t adjust your positions too quickly is that the probability of touch is about twice as large as the probability that an option will expire ITM. This means that most positions will be tested at some point before their expiration. I recommend checking out my article on options trading probabilities to learn more about the probability of touch and the probability of ITM. A common adjustment mistake is taking on additional risk. But this does not really make sense as the entire point of adjusting a position would be to limit your downside potential while still leaving some room for the upside. If your trade is riskier after an adjustment than before an adjustment, I would not consider the adjustment successful. An example of a good adjustment would be one in which you do not increase the risk, but you give yourself more time to be right. Another good adjustment of a losing trade could be one in which you move the breakeven point further out without increasing the risk. To prevent increasing the risk, I usually recommend only adjusting if the entire adjustment can be done for a net credit. But more on this later. Before adjusting a position, always ask yourself if this adjustment is the most efficient way to allocate your capital. Usually, an alternative to an adjustment would be to simply close the position and open an entirely new position. So before adjusting a struggling trade, ask yourself where your money will do more for you: in a new trade or in an adjustment of this trade. It only makes sense to adjust a position if the capital allocated to it will be at least as efficient as a new trade. Now that we covered some general adjustment guidelines, let us move on to some specific options adjustment strategies. Let me start by presenting an options adjustment strategy for the defined risk and defined profit strategy, short iron condor. A short iron condor is a neutral, range bound option strategy that achieves max profit if the underlying asset’s price is between the two short strikes at expiration. This iron condor was set up in The Strategy Lab. First, it is important to understand when you even should consider adjusting an iron condor. In my opinion, it would only make sense to adjust an iron condor, if the underlying’s price breaches either the upper or lower leg of an iron condor. I would not recommend adjusting an iron condor if the price stays in between the two short legs. The following image shows the payoff diagram of the iron condor that we just set up. The two arrows indicate potential adjustment points. The most intuitive way to adjust an iron condor would be to move the tested side further away from the underlying asset’s price so that the breakeven point is further out. Let’s say that the underlying price for the just-shown iron condor moves up and beyond the upper short strike price. Therefore, we close the short 105 and long 110 call options and sell a new call at the 110 strike price and buy one at the 115 strike price. is the original payoff profile. is the new payoff profile. As you can see, the new upper breakeven point is much higher than the original one. HOWEVER, the profit potential dropped and even worse, the total risk increased! This is a direct violation of the 4. adjustment principle that we defined earlier in this article. 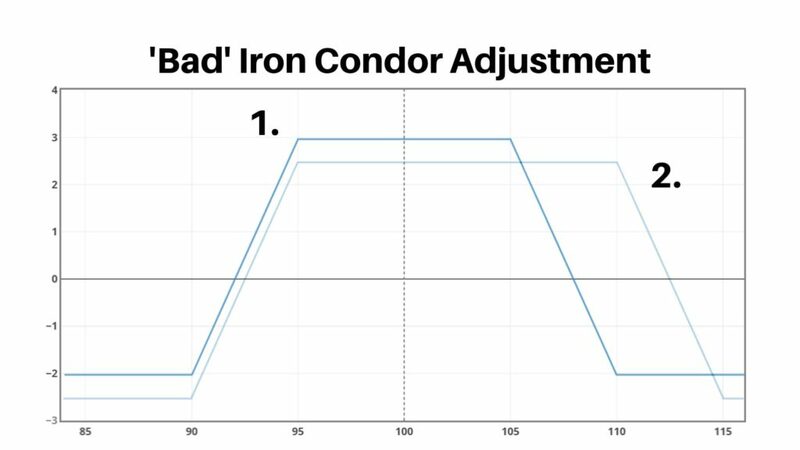 Even though it is definitely possible to adjust an iron condor like this, I would not recommend it as it increases the overall risk which isn’t something I would want to do with an adjustment. A better way to adjust an iron condor is to move the untested side closer to the underlying asset’s price. If the underlying’s price breaches one side of an iron condor, you usually aren’t worried about the other side. Furthermore, the other side normally won’t be worth a lot anymore as it will be quite far OTM. 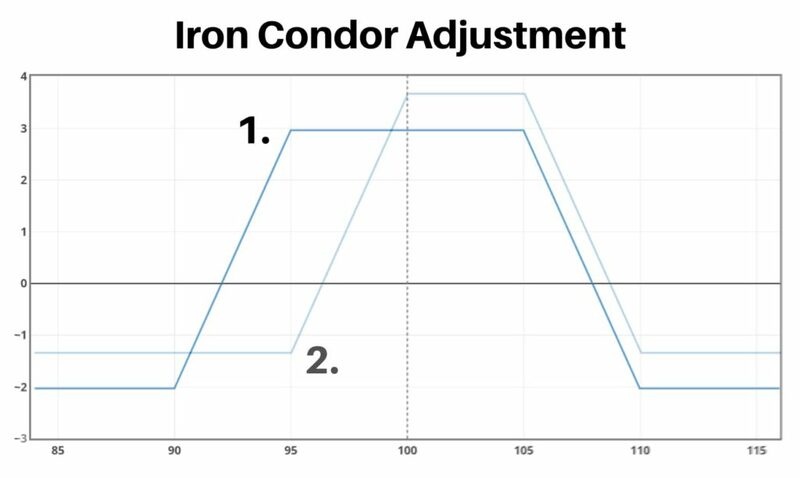 This iron condor adjustment technique takes advantage of exactly this. It allows you to take profits in the untested side and collect additional premium by selling a new side closer to the underlying’s price. This won’t only decrease the overall risk and increase the profit potential, but it will also move the breakeven point further out. In other words, it’s a win-win-win situation. This is how the original payoff profile (1.) looks compared to the adjusted payoff profile (2.). The only real disadvantage of this adjustment technique is that the profitable range becomes smaller. So if the underlying’s price comes all the way back, it might not be ideal. However, otherwise, it certainly outperforms an unadjusted iron condor. Let’s say you could make this adjustment for a net credit of $0.5. This would mean that the max loss decreased by $50 and the max profit increased by $50. Furthermore, the lower breakeven point was moved lower as well. What about straddles and strangles? 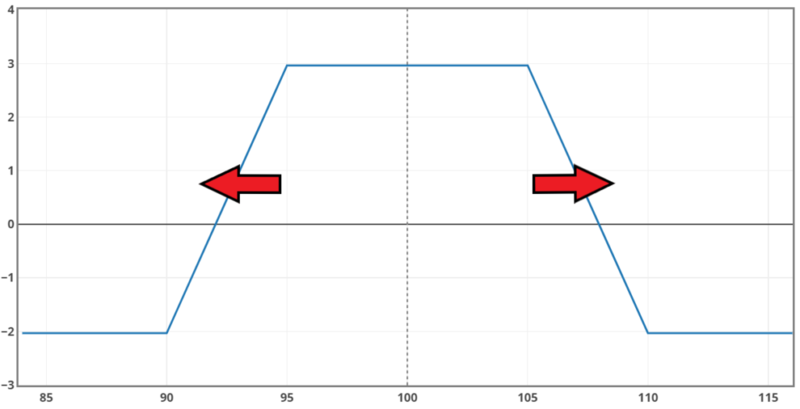 This iron condor adjustment technique can also be used for other options strategies such as short straddles or short strangles. All you have to do is close the untested side and sell a new option closer to the underlying asset’s price. Generally, just make sure to leave some room for the underlying price to move in. Don’t adjust too quickly and don’t adjust too aggressively! If you repeat the just-presented adjustment technique over and over again, your put strikes will move closer and closer to your call strikes. At one point, the short put strike might even become the same as the short call strike. If this is the case, you won’t be able to repeat the adjustment again for iron condors as you won’t be able to make the adjustment for a net credit. But if you are trading strangles (or straddles), you will still be able to continue moving up the put side (or moving down the call side). This would lead to your put strike being higher than your call strike. This is also known as ‘going inverted’. Now you just went inverted because the put option’s strike price is higher than the call option’s strike price. There usually isn’t something wrong with going inverted. Just make sure to collect enough premium to make the move worth it. You can’t go inverted for iron condors or other defined risk strategies as you won’t be able to do this for a net credit. We can use the same approach as we used to adjust iron condors for credit spread adjustments. One great way to adjust credit spreads is actually to turn them into iron condors. From there on you will be able to use the above adjustment method for any further adjustments. 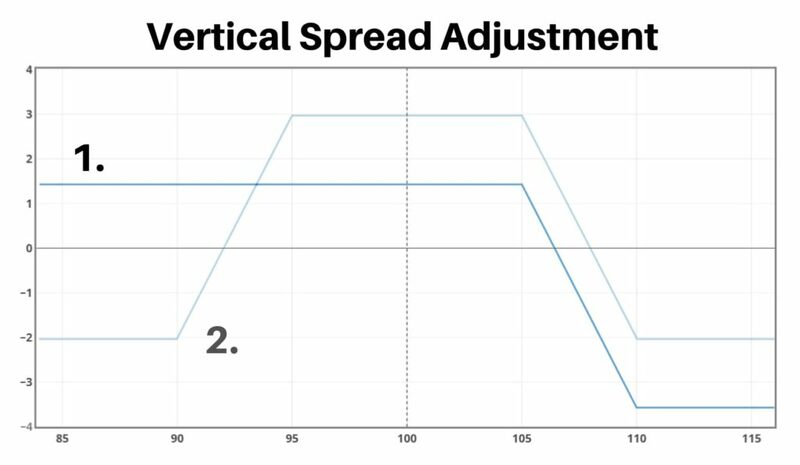 Similarly to before, a good adjustment point for credit spreads is when the underlying’s price breaches the short (or long) option. In our example, we assume that the underlying asset’s price moves up to about $108 (which is right between the short and long strike price). Now we sell a second put vertical spread to turn the original position into a short iron condor. The following graphic shows how the payoff is affected. After this initial adjustment, you could theoretically, move up the untested side, if the underlying’s price continues to rise (and you are able to collect enough premium). Like I said before, don’t be too aggressive with these options adjustment strategies. Give the underlying’s price some room to move in. You don’t want to sell the put spread too close to the underlying’s price. Otherwise, a big price reversal could hurt you. So far, we have only discussed options adjustment strategies that decrease your risk and increase your profit potential. In addition to these adjustment strategies, you can also adjust your positions for more time. The advantage of adjusting for time is that you give the underlying’s price time to come back into the profitable range. Keep in mind that when adjusting for time, we still want to consider the general adjustment principles defined at the beginning of this article. So we still don’t want to increase the overall risk of a position. In practical terms, this means that the adjustment has to be done for a net credit. How to adjust for time? The specific strategies to adjust a position for more time are relatively simple. All you do is close your current position and reopen the same position in a later expiration cycle. The only problem with this is that you often won’t be able to make this adjustment for a net credit. Therefore, you often have to change the strike prices in the new expiration cycle. Over the next 20 days, ABC’s price drops down to $185. This means that your strangle only has 10 days left until its expiration date and things aren’t looking great. Now, you could use the adjustment technique presented earlier in this article (where you move down the short call option). The problem with this is that, you likely won’t collect a lot of premium as there isn’t a lot of time premium left in the options. So what you could do instead is close the entire position and look at the options in the next expiration cycle with about 40 days left until expiration. One way of doing things would be to sell the exact same strangle in this expiration cycle. However, often, you won’t be able to do this because you couldn’t do it for a net credit. If this is the case, you could either move the upper strike closer to ABC’s price or move both strikes. With this adjustment, you just gave your position 30 more days to work out without increasing the risk. Furthermore, this adjustment moved the lower breakeven point closer to the underlying’s price. For which strategies can you extend time? Once again, rolling should only be done for a net credit. Sadly, this limits the strategies which you can roll to undefined risk strategies. You usually won’t be able to roll defined risk strategies such as iron condors for a net credit. So this adjustment strategy is mainly for strangles and straddles. You should not roll too early or too late. If there still is a lot of time left until expiration, you could either just wait or use the previously presented adjustment method in which you just move the untested side closer to the underlying’s price. In my opinion, a good time to roll your positions to the next expiration cycle is about one week before the expiration date. So in the week before expiration week. Even though adjusting your struggling positions can improve your overall profit and loss, it is important to not overestimate the importance of adjustments. Adjustments can be great, but you should still focus most of your attention on the trade entry! There are obviously many ways to adjust options strategies. But in my opinion, the options adjustment strategies presented in this article are some of the best. But feel free to incorporate other adjustment techniques into your trading as well. My advice for this would be to still follow the general adjustment principles that I outlined at the beginning of this article. Furthermore, make sure to not adjust too aggressively. Always remember that it is quite likely that a trade will be a loser sometime before expiration. So just because a position goes slightly against you, does not mean that you should immediately make an adjustment to it. Define a rational adjustment point and adjustment strategy as a part of a clear trading plan before opening a trade and then stick to this plan. Generally speaking, undefined risk strategies are easier to manage than defined risk strategies. The tradeoff here is that undefined risk strategies are per definition riskier than defined risk strategies. So depending on your risk appetite, capital and other preferences, you might prefer one over the other. But I would not say that one is clearly better than the other. All the strategy images and adjustments were taken from The Strategy Lab. The Strategy Lab is a tool that TradeOptionsWithMe recently developed to help traders deepen their understanding of the options markets. I am very happy to hear that you learned something from this article. If you want to check out more of this kind of content, you could check out my free options trading courses. This is a wonderful article that must be read by all traders. I must say that your article is really informative and helpful and your efforts in putting this article together to share with us is appreciated. I have really learnt something valuable today on the adjustment techniques will help me minimize my risk without eliminating the potential for profit in trading. Great job! Thanks for the positive feedback. It’s great to hear that you enjoyed reading it and learned something new. Thank you for this insightful and educative write up. Though I have been trading stocks for some years now, I want to learn more about options. The Strategy Lab looks like a great tool to learn more about options strategies. I will reread this article again to better understand everything. please I’m not very clear on the part of when to roll. How would I know I am not rolling too early? I can’t give you an exact answer because when to roll can vary from situation to situation. Generally speaking, I would probably not want to roll earlier than three weeks before expiration. The idea behind rolling is to extend time, so if you still have a lot of time left until expiration, this adjustment doesn’t make that much sense. I hope this helps. Make sure to let me know if you have any other questions or comments. Thanks for sharing your thoughts. I agree that taking profits is an essential part of profitable trading.